A group of students crouch to inspect the large family of mushrooms that emerged since our last walk to the big stump, only days before. This tree has been a stump for years now, but the children know it as a living thing, where plant and insect life is always found tucked in around its edges. My son's friend holds a very patient toad that we found in a dry creek bed section of nearby Etobicoke Creek. My daughter and I splash our feet in the water beneath the waterfall on the creek, upstream from where we found the toad. A week later, after heavy rains, we can't access this spot due to the high, rushing water. Our relationship with the creek means we come to expect the changes, and also anticipate what creatures we might see: a glossy mink, a stalky night-heron, dabbling ducks. There are many ways to go to explore the beautiful Kortright Centre grounds, but it is this path that slopes steeply into the treed valley that always calls me first. Inviting in every season. On May 23rd I attended an event, a day so touching and magical it seems wrong to call it by its proper title, "conference". 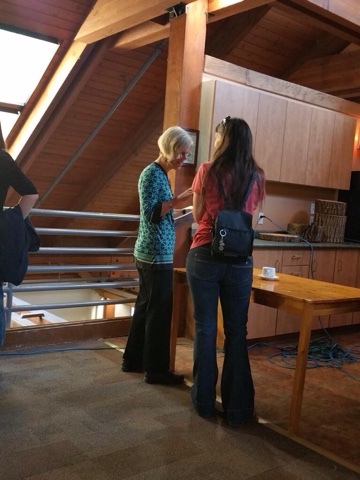 This was a gathering of educators inspired by forest school teaching, outdoor education, Reggio-inspired pedagogy, and by the incredible author, Ann Pelo. It was in the middle of a very busy week, chalk-filled with exciting events that took me far and wide around Southern Ontario. There'd been a small dinner gathering of friends of the York Region Nature Collaborative (YRNC) on the evening before the conference, a fantastic trip with my teacher partner to visit the "Artists at the Centre" exhibit, and a delightful gathering of educators at Sunflower School's "Mystery of Materials" conference in Orangeville on the following weekend. As such it only remained a fond memory, a collection of images, tweets and videos shared once home (where the wifi is), until I was finally able to review the penciled notes I'd take that evening. My few notes brought back the sights and smells even stronger than the photos had - it was a full-bodied sensory experience of wonder, connection, and joy. Those notes begin the story as it unfolds, below. Today was a timeless sort of day. It arrived after much anticipation, as I'd long been looking forward to this opportunity to hear Ann Pelo speak again. Last year I'd been so moved by her keynote address at the #BECS2014 "Unhurried Conference" at Charles Sturt University where she showed slides and read snippets of her beautiful book "The Goodness of Rain". Her book sold out that day, and as I was unable to obtain a copy, I decided to wait until her next visit so that I could purchase and have the book signed. Wanting to connect with her words, recently I delved back into her earlier book "The Language of Art" which is one of those transformational reads that seems to get deeper and more meaningful with every reading. I felt so connected to her message at last year's conference: teach with open heart, open ears, and open mind. Then to re-read the description of the atelier, a place to be mindful of every action and every material, to celebrate beauty and expression, it was almost too much to bear waiting. As I arrived this morning, I drove up the long winding driveway to the Kortright Centre with the windows rolled down in spite of the chill in the air. I wanted to smell the air, feel the moisture, and hear the sounds in the hills around me. The Kortright Cente is a special place for me, a place I've been going for many years though it's not close to home, a place I love even more these last 14 years that I've had kids to share it with. Last year's event, “A Family Adventure Walk in the Forest” in October 2014, also hosted by the YRNC (which I am proud to support in any way I can) was one of the most magical days I've ever spent with children, and that's taking into account my baker's dozen years of teaching Kindergarten. I had the privilege of hosting one of the stations that day, a place to celebrate my passion for "looking closely". Mine was the pile of dirt with sticks for digging... wisely assigned because truth be told if I had been given another centre I'd had dropped what I was doing every time an interesting bird or insect came into my awareness. Allowing me to spend the afternoon looking closely around our little "mountain" of dirt was a gift. Being a supporting member of the YRNC (long distance and thus only when possible) has been a professional highlight, helping to further my own teaching practice as I collaborate with inspirational educators and ecological stewards. 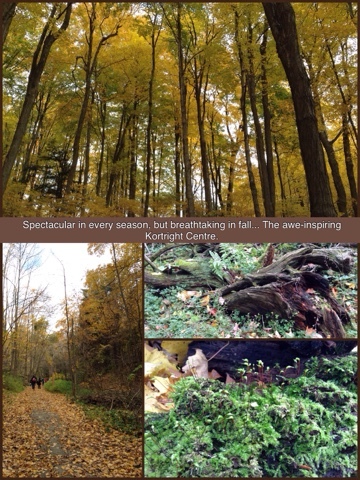 Kortright splendour during the first "Family Adventure Walk in the Forest". A moment that brought me to tears: my daughter spent much of the afternoon with a group of friends including some she'd met at the last YRNC family gathering, the "Forest School Taster" held in the summer at Lake St. George. 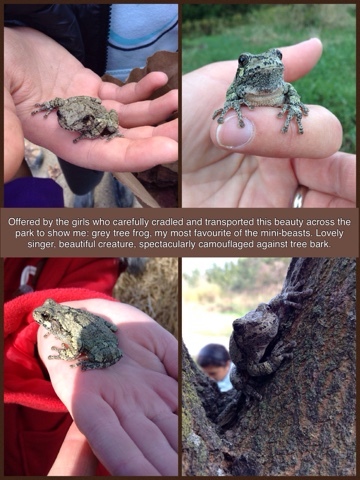 When the group found this beautiful tree frog, they carefully captured it, created a safe transport (a leaf-lined paper bag), and ran through the woods and up the hill to my "look closely" station. Though the park was full of hundreds of people who were there for "Family Adventures", the girls decided that I was the one that would most appreciate their find. It made me very happy. Some of the delightful creatures and people who appeared at my station during the "Family Adventure Walk". I was intrigued by the responses to this station: some adults stood back while the children climbed the hill and dug into the soft dirt, while other adults joined in with great relish, holding up worms or centipedes to the delight or fright of their children. Initial squeamishness at seeing the contents of our "mini-museum" (pictured above in the bottle sections on lids) usually gave way to fascination and even exploration. As I got out of the car this morning for the conference, I was immediately drawn off the path and into the woods by the familiar spring sound of a bird I like to call "the monotonous robin". It returns every year and somehow every year I remember the song (like a faster, endlessly repeating robin song) but I forget the singer. 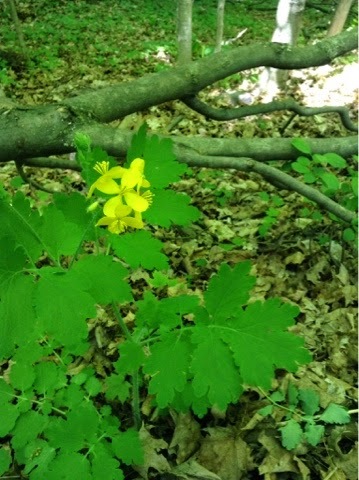 I ran into the woods in pursuit of the song, hoping to catch a glimpse and thus identify the singer. No luck, it was evasive as always, but I found myself through the trees onto the great lawn, walking in warm sunshine up to the crowd gathering at the entrance. I saw so many familiar faces, both friends I've made in recent years and those faces I knew only from our twitter PLN. I likened it to being a bride: all the beloved people in one place but really wanting to dote on the groom. It was almost too much for me, as I wanted to chat with everyone but I was also in a special place that demands my full attention... a forest vibrating with life in every corner. I needed to be quiet, to listen, to slow down to be in forest time. My nature self won over my social self before I became exhausted. I tuned my senses to the life everywhere around me. Before the keynote I was able to ask Ann to sign my beloved copy of "the Language of Art". I thought it proper to offer a gift in exchange, and as I'd connected deeply with her idea of the belonging to a place, a pedagogy of place, since her keynote last year, I gave her the best gift I could think of: a small jar of beach glass and a fossil-filled stone from the shore of Lake Ontario. I find these treasures the nearby beaches along the western edge of Etobicoke, the shore where time seems to lose its grip on me. To my relief and delight, she was as curious about these objects as I am. Sharing the story of my beach while Ann signs my book. Photo by Stef. 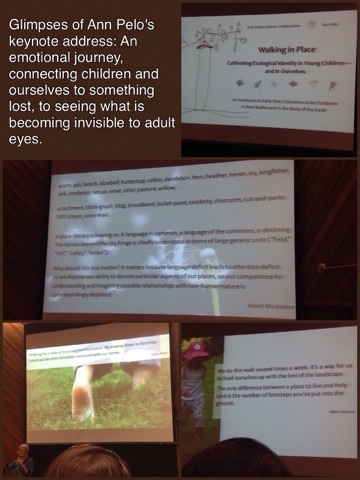 The full name for today's event was "Walking in Place: Cultivating Ecological Identity in Young Children - And in Ourselves". The title long but reflective of the connected elements at play: by sharing a point of view, a mindful awareness of our surroundings, together with children we develop a relationship with the natural world. Ann began her keynote by describing how she was "energized and curious" by the invitation to share her story in such a unique way, "walking in place" with the conference participants. She shared observations, personal stories, and quotes. In fact, the quotes used in this post are from Ann's handout, kindly shared with participants so we might enjoy her presentation in the moment without the need to scribe. Once the keynote began, I took some notes but was grateful that Ann had thought to include her most touching quotes in a handout so that we the audience could simply be present without needing to capture words as they flowed by. I did, nonetheless, jot down ideas and my impressions as they came to me. Ann set the tone by having us join her in reciting a traditional Haudenosaunee Thanksgiving Address (adapted by Karen Kerney). Greeting each other, the earth, all beings alive, all materials that sustain life (water, sun, air we breathe) we came together to see ourselves as part of an enormous, organic whole. From there she began with the first step of our journey, figuratively - she asked us to consider the origins of the word "foot" which connect to planting - planting one's foot in place. The quote below struck me as true, as both obvious and deeply meaningful. At that moment I realized why I had fallen in love with my neighbourhood, and why I'm torn by the idea of leaving it just because our family has outgrown our home. As she continued, Ann made reference to some of the stories in her latest book, The Goodness of Rain, which is an intimate story of her year with Dylan. Dylan was a toddler, speaking few words when they first began to spend each day together. I remember being mesmerized with these stories when I'd seen Ann at Charles Sturt University last year, and was eager to hear more about that magical time they'd spend walking. As Dylan grew and developed words for what was around her, Ann captured the story of their daily walks and noticings. A particularly poignant image is that of Dylan and the apples - fruit of the tree they visit daily and thus become to know in its every state, from abundant to bare. I didn't capture her exact words, but loved her description of Dylan's joy at smelling, plucking, and eventually eating the apples. Ann alluded to the biblical tale of how apples came to be a symbol for the downfall of humanity, how we were banished from paradise after one taste. She described Dylan's astonishment and delight at finding this gift (paraphrase): "not a fall from grace, but a fall into grace... knowledge of connection to earth, to our growing... attuned to call of wild earth, we know the earth, taste it, feel it." She quoted David Orr, alluding to all that naturally grows out of being happily astonished by nature. An ecological identity is driven by a sense of wonder, the sheer delight in being alive in a mysterious, beautiful world. Ann spoke of the importance of our role as teachers, what it means for us and what we are trying to do (paraphrase from keynote): "We teach children the languages of art, writing, reading, maths - we actively cultivate knowledge. (We) also need to cultivate ecological identity - sense of self belonging in place." She went on: "Our culture celebrates knowledge, not experience, of ecology, of nature. (It is a) commodification, an intellectualization of nature, of knowing versus being. For the urban teachers, nature isn't a forest, but spiders in the playground, puddles in the parking lot, ants in the crack of a sidewalk." She proposed principles for pedagogy of place, those outlined in her book but offered not as commandments, instead as an invitation for beginning our own personal journeys. Ann urged us to develop "a pedagogy of play... present, in unfolding time". It was a powerful moment, one which caused a number of us in the room to choke back tears (or brush at those that escaped our eyes). Looking at the tweets later I found examples of this. #WIP2015 Ann Pelo: experience holds the seeds of love. That's why experience matters. It hold us accountable and we can love with hearts. One principle that I found deeply meaningful was that of "learning the names" of the flora and fauna all around us. In my last post, "a time to learn the names", I related it to my own experience growing up with a strong ecological identity, though I didn't have a word for it, or recognize it as I grew up. It was simply something that separated me from most of my peers, and as such something I kept quiet about when I was young. No-one (outside of family) seemed to want to hear that the peeper frogs had begun singing that week, or that the milkweed seeds were still green, just right for eating (before turning brown and sprouting white fluff), or that the young puffball mushrooms were delicious sauteed in butter, or that the bird they thought was an owl singing in daylight was actually a dove - a lovely bird and my middle name. Ann spoke about the people who "learn the names" because they fall in love with some aspect of the whole living, breathing ecosystem (birds, mushrooms, flowers, insects). She said, "I bought my first field guide and poured over it like a love letter". I identified strongly with those words. While listening to the keynote, I jotted down a note about my favourite non-translatable word, "komorebi". I wanted to share it with Ann after the keynote, though I missed the opportunity to do so. It is a word that I needed as a child, when I first fell in love with the Arctic as seen in images (National Geographic, at the McMicheal Gallery) and later on television (The Nature of Things). One day I imagined visiting the "land of the midnight sun" and talking those who lived there. I wondered what it would be like to grow up without trees. It actually pained me to think about it, life without trees: no dappled shade on a sunny day, no dazzling red fall, no sounds of leaves in a stiff breeze, no smells of pine after a rain, no boughs to climb in and hide. I wondered how on earth I could portray all this beauty and wonder with words. When, as an adult, I learned this wonderful word, it fit like a well-worn shoe. It’s a lexicon we need to cherish in an age when a junior dictionary finds room for ‘broadband’ but has no place for ‘bluebell’. A place literacy is leaving us. A language in common, a language of the commons, is declining. The terrain beyond the city fringe is chiefly understood in terms of large generic units ("field," "hill," "valley," "wood"). Why should this loss matter? It matters because language deficit leads to attention deficit. As we deplete our ability to denote and figure particular aspects of our places, so our competence for understanding and imagining possible relationships with non-human nature is correspondingly depleted. Robert MacFarlane, "the word-hoard"
There was more to the story, not simply the loss of names but the loss of life - that knowing the inhabitants of our precious world would make an enormous difference in how humans treat the flora and fauna of the earth. Ann spoke of the pang of knowing the world and also knowing about the terrible impact of our human actions upon it. Attention: the remarkable focused convergence of our senses, our intellect, and our feeling. Ann invited us to "explore new perspectives. Name help us know but also grieve the losses. Marvel and despair". With that we were ushered out into the gloriously sunny day to enjoy time in the woods before lunch. Heads full, hearts open, we scattered into the outdoors. After the keynote we were free to wander the sun-dappled paths and flowery meadows to visit the wonderful invitations set up all around the site. Our wandering was motivated by our own fascination with the spring flora and fauna all around us, and as such we didn't get to even half of the green-signed stations. 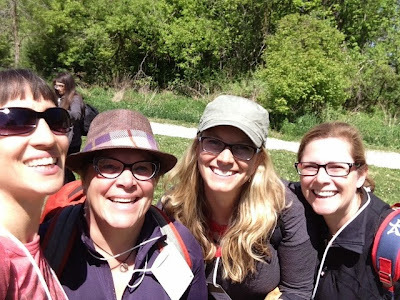 My joyful and curious companions for the day: (me), Karen, Tanya and Kim. 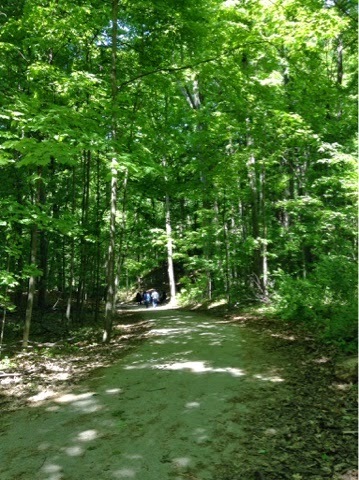 The company of like-minded friends sharing a walk in the magnificent rolling hills and shady forests of the Kortright Centre made this an unforgettable event. The beauty of the foliage and the delicate flowers blooming around the forest floor gave us all a sense of overwhelming beauty. It was as exciting to make new discoveries (such as this specimin above) as it was to uncover "old friends" underfoot such as herb robert, trilliums, and blood root. 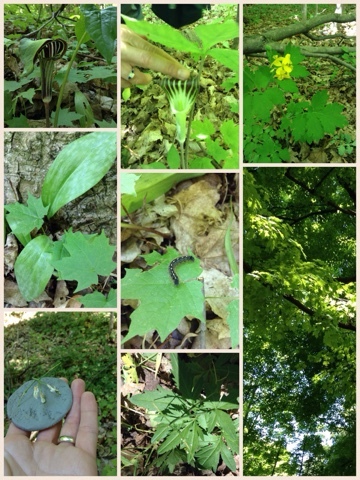 Underfoot and overhead were many reasons to go slowly and look closely: blooming jack-in-the-pulpit lily, a swallowtail butterfly landing above us amid maple leaves, a tent caterpillar along the path, delicate flowers on as-yet unknown plants. We were hungry to learn the names. As we walked down the long, steep incline into the forest, our senses grew attuned to the life all around us. Though there were inviting activities set up for us to enjoy, we found our own rhythm following butterflies, stopping to admire caterpillars, listening to songs in the trees. Partway down to the valley floor I was stopped in my tracks by a familiar (but long unheard) sound: an ethereal, reedy song like a wooden flute. I halted our group and opened up my trustworthy iBird app, hunting the right bird. I tried veery, but no. The other forest-dwelling thrush with such a haunting voice, then: a hermit thrush. My companions were amused, and then amazed, when the song in the iPod was identical to that we were hearing overhead. I'm cautious about using the app in this way, knowing it's possible to upset nesting pairs or simply annoy the very creatures I wish to observe. Once identified, we walked on, meandering from one side of the path to the other as some new sighting caught the eye of one of us. May in southern Ontario is a spectacular time for a phenology fan; everywhere leaves are fully grown on most deciduous trees, meadow and shade flowers everywhere are in bloom, frogs and birds are singing their mating songs. No words can capture the smell of the woods at this time. Green in so many lovely shades. Mid-spring is a time of rapid change in nature. At the campfire station, we marveled at the textures, patterns, and variety of sizes amongst the leaves on the forest floor. 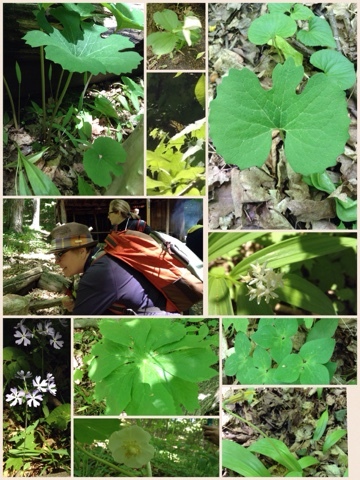 At the top, bloodroot and trilliums. In the bottom-middle panels, the wondrous mayapple in bloom. Down in the valley where the campfire was burning (and where every year my family goes to enjoy the maple syrup demonstration), we paused to rest a while. I spotted a flycatcher of some sort. Excited, I ran to get a better look. I couldn't get close enough, but underfoot was an amazing variety of plants that one can only see in mature, deciduous forest. I recognized some but many more were unknown to me. I thought of Ann's comment, falling in love with a field guide that gives her names, a literacy or a language with which to speak in the natural world. 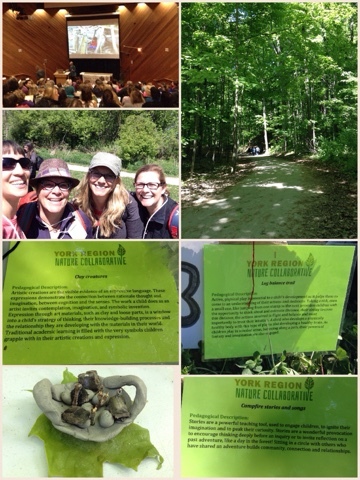 Nearby at the campfire was a fellow YRNC member and Kortright's Program Manager, Adrian O'Driscoll. I knew him to be a keen observer of the nature, so I invited him to help us identify some of the mystery foliage we were seeing. He pointed out several, but the one that I remember most vividly was the utterly enchanting "mayapple" (above). 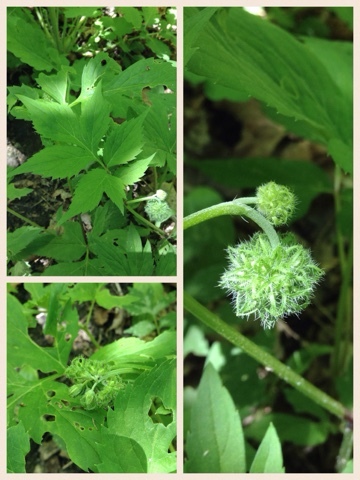 This intriguing plant had an umbrella-like circle of leaves nodding atop a long stem. From above, it was interesting, but from below, it was captivating: a single white flower presented like a face, peering out at us. We all knelt down for a better look. Then I remembered the song that had me mystified. I described to Adrian the "monotonous robin" that we had been hearing. "A vireo, perhaps?" Just like that - without hearing the bird, merely from a description, he solved my mystery. I shall never again forget the name of the red-eyed vireo, the singer that often makes himself heard but rarely seen. This plant captivated us when we were out on our walk. Kim had shown me a picture of it earlier on, asking if I recognized it. I didn't, but spotted it on our walk. Such a delicate and complicated flower head, unbeknownst to us, ready to bloom. It was a new find, and we had to uncover its story. As the stations closed and the call went out to go for lunch, we made our way back up the hill. Out in the meadow I was stopped again, this time by a bird I knew well and could call into view. I whistled a response to the singer, and sure enough, the brilliant orange oriole appeared from within a leafy hiding spot (click here for snippets: mayapple, leaves in the breeze, the song of the oriole). We felt so much in forest time, so connected. After lunch we re-convened for Ann's summation. It was a different mood in the room, now, a place buzzing with conversations about the morning amongst friends. It was uplifting, even before she spoke. She invited us to bring the feeling we had to our daily lives, to step out with awareness and kinship with life. It wasn't easy to leave. Many participants dawdled on their way out to the parking lot, and more still walked right back out to the paths. My companions and I took our time, stopping to chat with some chickadees and enjoy our final moments in the forest. 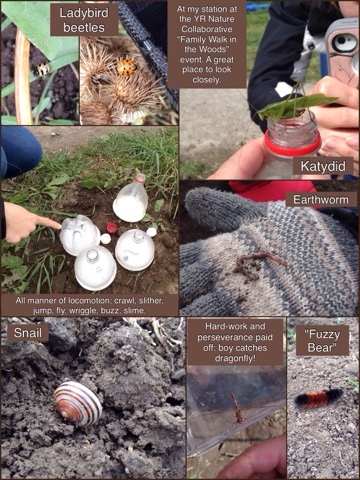 We talked about our own teaching and learning in nature, and what we hoped to do from this day forward. We thought about how we could share this feeling. Leaving Kortright was hard that day. I was still feeling very much attuned to my outdoor surroundings when I arrived home, so I took my daughter to a nearby for an evening walk along the shore. As she ran over rocked and danced along the edge of the waves, I felt hopeful that she would grow up knowing the landscape as her natural place. The next day, stories and images from the conference continued to be shared on twitter. I had worried, during our play amongst the trees, that my companions might regret having missed all the stations set up around the centre. As I saw the beautiful pictures later on twitter, I experienced a twinge of regret that we hadn't made it to the mandala station, for example. The responses from friends changed my mind. The way it came together so perfectly for us, traveling together through that sacred space, made it magical. I am grateful to my companions on that day. Ripples were carried outward as our sheer delight left traces throughout our PLN. Many messages such as the one below made me hopeful for continuing the conversation. 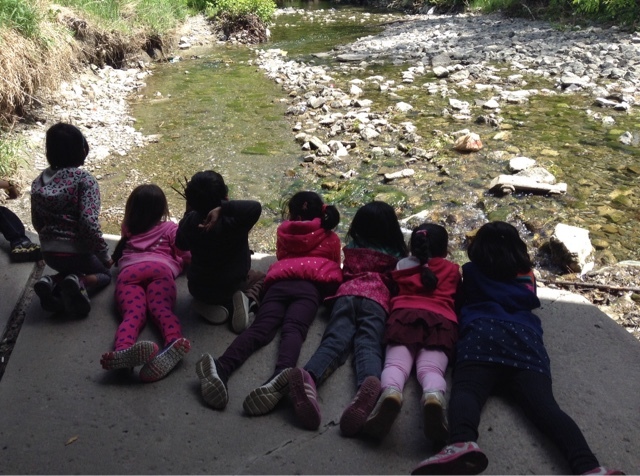 A spring walk: we're peering into the gently moving water of Cooksville Creek.